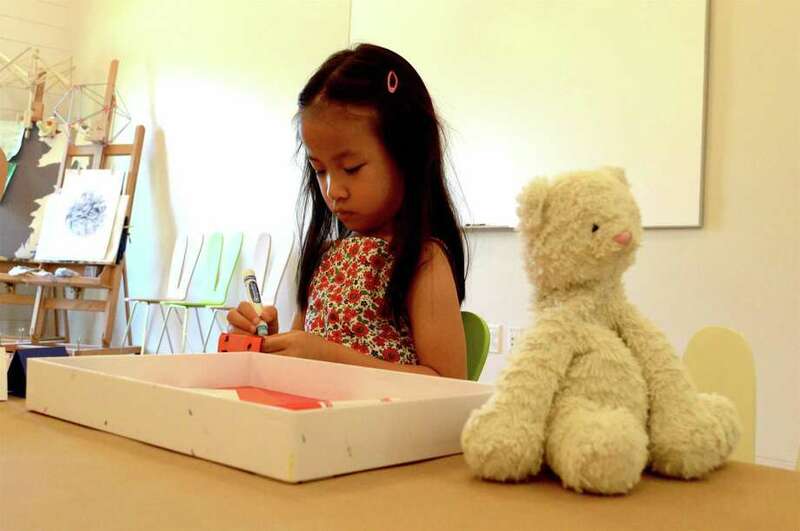 Bella Zhou, 5, of Stamford colors her project at the Open Arts Studio class on Saturday, June 30, 2018, at Grace Farms in New Canaan, Conn.
NEW CANAAN — With this weekend’s hot weather came a cool opportunity at Grace Farms’ Open Arts Studio to explore, construct and create. In celebration of the architectural design that makes Grace Farms unique, kids made buildings and constructions out of unusual shapes and materials. “I feel like part of the bigger project of Grace Farms is to get children thinking in an interdisciplinary manner (combining) architecture and fine art,” explained Mary Janacek, Open Arts Studio coordinator. “We also try to do inquiry-based projects, which get kids exercising their creativity and imagination,” she said.